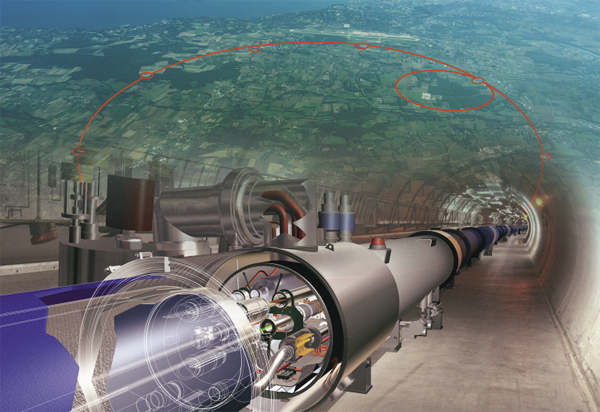 The first collisions from the Large Hadron Collider LHC the world’s largest and highest-energy particle accelerator took place in Geneva just after noon today BST.Ending more than a year of frustration for scientists on the project. “This is a major breakthrough. We are going where nobody has been before. We have opened a new territory for physics” explained Oliver Buchmueller, one of the key scientists on the Cern project. In the experiment the atomic particles are smashed together in head-on collisions, with each beam having an energy of 3.5 trillion electron volts. Scientists are mimicking the conditions moments after the Big Bang and hope that the LHC will eventually find evidence for the existence of the Higgs boson. A particle that theoretically gives matter mass that has never been detected before. Giving new insights into the nature of the strong interaction and the evolution of matter in the early Universe.